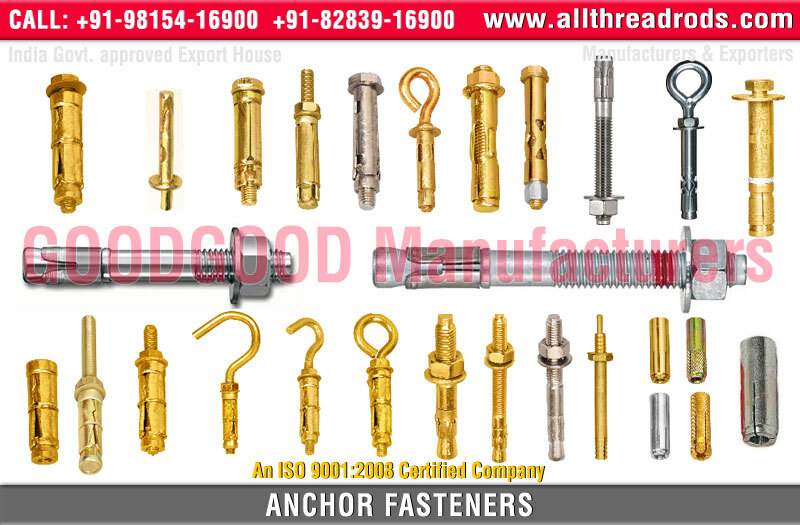 Goodgood Manufacturers Ludhiana, Punjab; is a largest Anchors Exporters, Distributors, Manufacturer & Suppliers of a wide range Anchors, anchors fasteners, wedge anchors, wedge bolt anchors, projection anchors, heavy duty shield anchors, heavy duty hooks, eye anchors, eye anchors bolts, hit anchors, wall anchors, wall anchor bolt, wall anchor screw, anchors fasteners industrial, drop in anchors, heavy duty fix shell anchors, tam anchors, sleeve anchors, sleeve anchors concrete, chemical anchors, expansion anchors, stainless steel anchors, hollow bolt anchor that is manufactured using quality material. Our Anchor products are available in various dimensions & specifications and are extensively used in cement, steel and petrochemical industries. Our Anchor products are available with some special features like durability, rust resistance, high tensile strength and low maintenance. 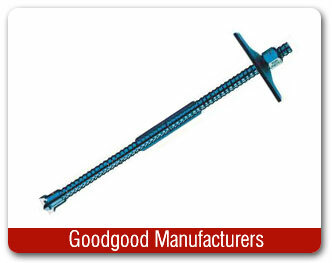 Goodgood Manufacturers is a Ludhiana Punjab based company engaged in manufacturing of all types of Threaded Bars, Coil Rods - Tie Rods, Threaded Rods, Thread Studs, Threaded Studs with Nuts and Anchor Fasteners, Pole Line Hardware, Transmission Line Hardware, Hydraulic Hose Fittings etc. Our main motto is to manufacture quality and safe Threaded Bars Products. Under the wise directions of Sh. Rajan Dawar the company has acquired years of experience in the Threaded Rods and Thread Studs products, with a clear vision in mind to promote our leading company with quality products and reliable customer service. The company's brand Goodgood on our various Products show our quality products. Goodgood Manufacturers has a large number of satisfied clients across the world, Our organization that provides its clients with the best quality of products and services, which simultaneously following the highest standards of propriety.